I just love these stunning Rune pendants made of Sterling Silver by Keith Jack Jewelry. Imported from Canada - choice of two popular romantic phrases .. my love, kiss me .. or Remember me, I remember you, Love me, I love you. 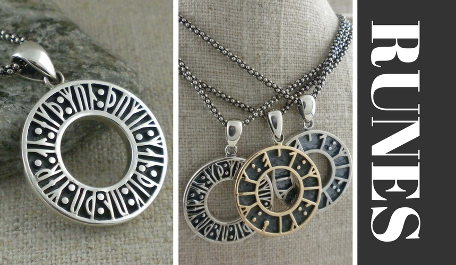 These pendants are part of the Runes from the Norse Forge Collection by Keith Jack Jewelry and are available in sterling silver or sterling silver with 10K text. The word "Rune" means "secret wisdom" or "mystery". The runic alphabet is comprised of a 24 rune sequence, like the alphabet, that is known as the futhark. Like other phonetics based alphabets, each rune represents an idea and a sound, making them useful to spell out words. Though most experts believe their creation occurred sometime in the first century A.D., there are some who believe runes were first used as early as 200 B.C.